The lifts on the Paganella are open already, and with them a good number of the slopes thanks to the snow-cannons; the rest will follow shortly. But little snow has fallen on the peaks, just a thin dusting of white, and the call of the mountains, especially when you have them everywhere in your field of vision, is always strong. 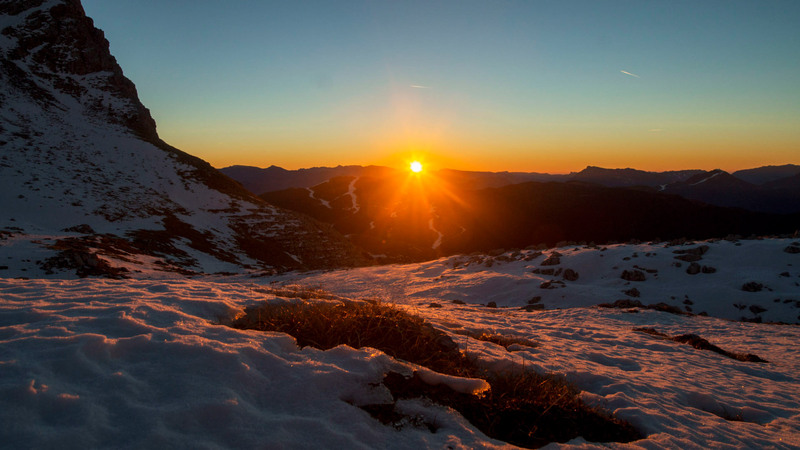 It must be a shared feeling, and in fact two days ago I get a text message: sunrise in the Brenta . I’m of the party right away. It does not matter if we have to leave at 4:30, I will sleep tomorrow. The chain of calls starts, the rolls are called, backpacks are readied and filled, a piece of homemade bread and cheese, the thermos with hot over-sugared tea and the camera. At the rendez-vous there are five of us, weary-eyed, plus my dog who for good measure slept beside my backpack for the night. “You will not leave without me.” By car we go up to the La Montanara refuge, and from there we begin our slow ascent. Besides, I can not say I’m awake, like my companions of adventure. Within an hour, after 300 meters of zig-zagging up through the woods, we reach the first stage of our path at Palon de Palon de Tovre. 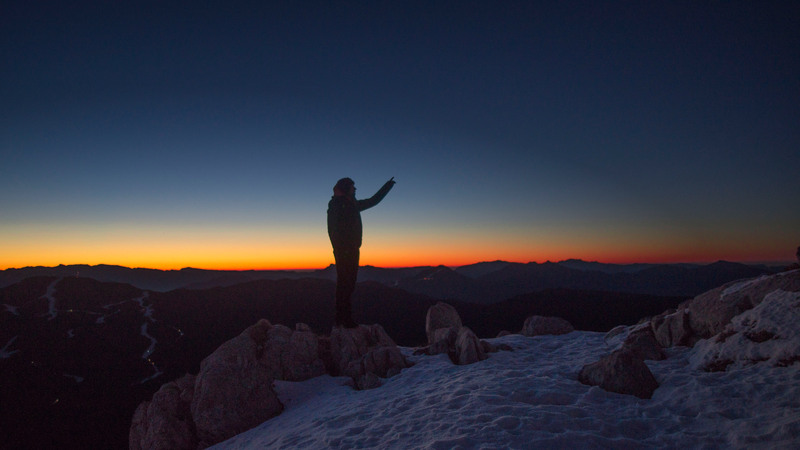 We are 1811 meters high, and we enjoy a spectacular view of the moonlit Piz Galin peak. We stop and eat half of the chocolate carried by the group. We take a second break, as we are slightly ahead on the schedule, and then walk the last meters in the snow, with just a little more attention. Falling here, down a cliff so high it’s unnecessary to estimate its height, would be fatal as well as extremely embarrassing. 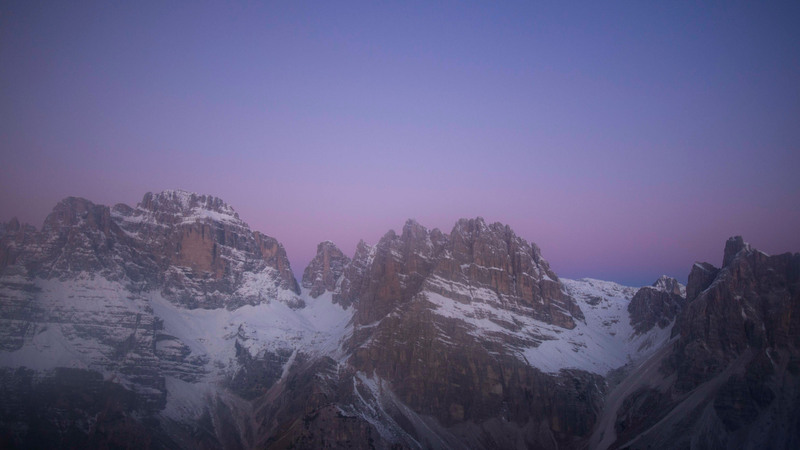 Leaning against the cross bearing the name of the summit, we sit looking at the Brenta group in front of us, glowing between the colors of the incoming dawn and the dying night. Satisfied of this sight, three of us head down to Passo Lasteri. Filippo, who first suggested our nightly excursion, calculated that from there we should be able to see the waning moon settle exactly in the middle of the Tuckett Pass. 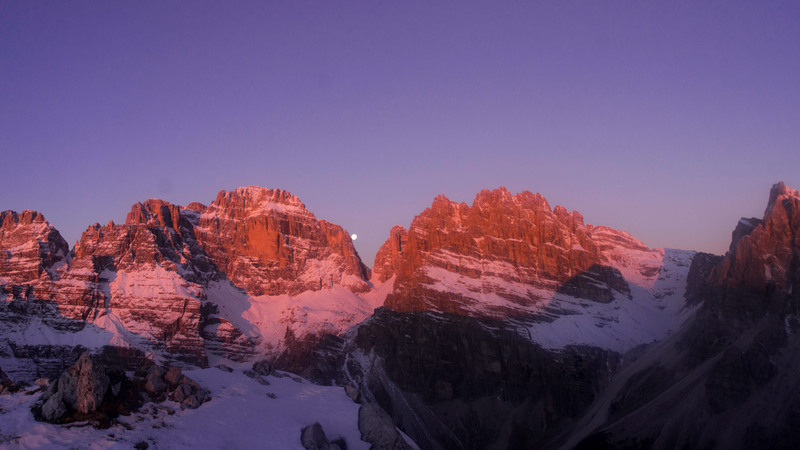 The first rays of the sun strike the Brenta to our left and paint it pink and red as we run on the snow to reach the Pass. We turn to look and the moon is exactly where it should be, and for a few minutes we enjoy its descent until it lays in the Pass, and then disappears and lets the sun fill the sky. We check our watches, and it’s just a few minutes past eight. We are in no hurry to go back home so we sit down to eat some bread and cheese as the sun rises. We cheer as the two other members of the expedition launch with theyr paragliders, the multi-colored sails rising from behind a ridge and already they are gliding below us heading for the valley floor. Perhaps 100 meters away from us, a couple of chamois emerge that Zama, my dog, is ready to send fleeing with a bark, and behind them a whole herd. In a few seconds they are running through the rocks and we lose them. One last look from the top at the sun that comes out over the horizon and we egin the descent.